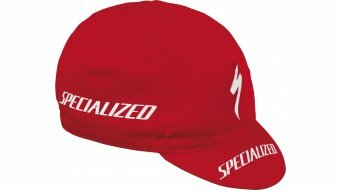 Whether a leisure-time cap (visor cap) with cool logo print or the retro cap in form of a racing cap for the nostalgic on two wheels. Here in our online headgear shop, you will find all bonnets, headscarves, bandeaux, beanies and balaclavas/helmet caps (for cycling). We hold visor caps or also casual caps available for you in a wide selection of all cool bike brands. For example Fox Caps, Troy Lee Designs or Oakley caps. Whether on your sportive rounds on skates or just as a cool addition to your street outfit. No matter whether your hair just is not prepared or whether the sun is not supposed to dazzle you today, a cap should be found in every wardrobe! And if you have one, than it should have the right look with a cool print or stick on it. Especially in summer, buffs are favoured. They are light, thin and multi-functional. Buffs or coloquially also bandanas are versatile and especially popular. Whether worn around the neck or knotted as a pirate's headscarf or beanie under the helmet. The colourful selection of designs is huge! Different fabrics are also used, that's why you'll also find buffs with fleece insert for cold days in our selection. Or smaller scarves, such as the buff for kids. Of course the HIBIKE buff is indispensable in our range. Now with the new "Hauptsache Fahrrad" (One Love. Bikes!)design. Helmet balaclavas or face masks for the helmet usually are a little warmer and are used in spring, autumn and winter. Here, you will often find soft shell or also wind stopper materials, which protect against the wind and coldness but still allow the head to breathe. At rainy weather, you should have a watertight helmet cover in your luggage, if applicable. Such a cover is quickly pulled over the helmet and thus, head and hair remain dry. But In winter, when push comes to shove at icy temperatures, you should use a balaclava, if applicable. Those are storm hoods and/or masks, which keep the entire face, throat and neck warm. They are also called face masks or face protectors. Don't let it spoil your fun if you are cycling in winter and your face suffers from the bone-chilling cold and biting wind . With a mask, your complete face is protected from the wind blast and cold. Discover our large selection and the different categories regarding the subject of headgear - here at HIBIKE.